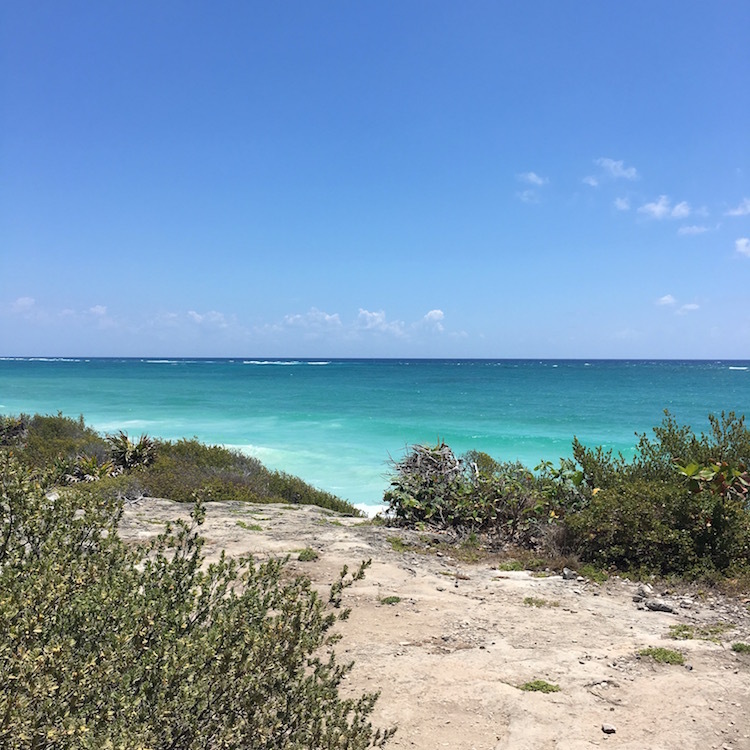 Blue-green water, open-air restaurants, shipwreck-inspired hotels and a shopping scene that you might expect in Soho make Tulum endlessly enticing. Tulum, a bohemian beach town on Mexico’s Yucatán Peninsula, is popular for a reason. Beautiful blue-green water, excellent open-air restaurants (many owned by American expats), shipwreck-inspired hotels and a shopping scene that you might expect in Soho make it exotic, yet familiar. And it’s relatively easy to get to. Many American cities offer direct flights to Cancun. From there, it’s about a two-hour drive. Here’s more on what to do in Tulum. Castle remains at the Tulum Ruins. 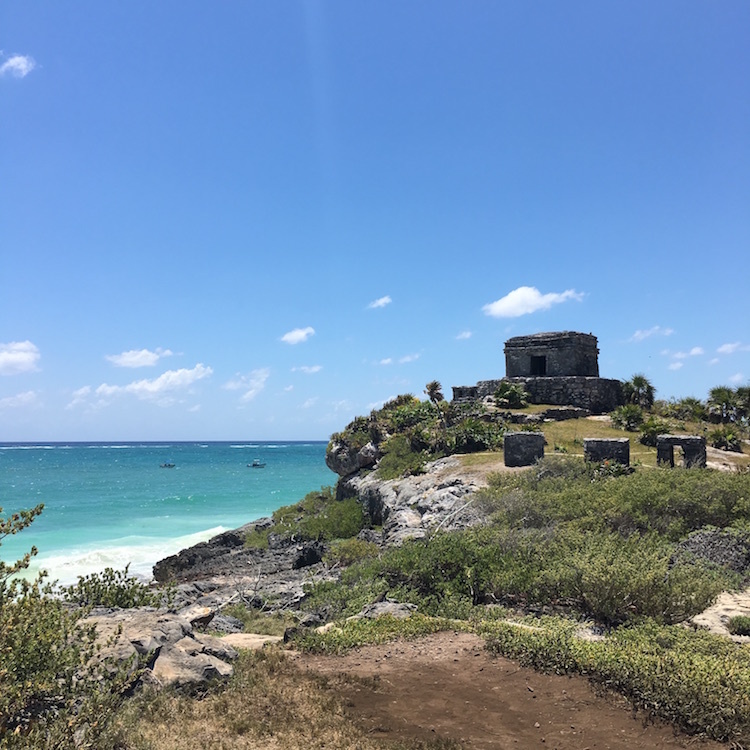 No trip to Tulum would be complete without a visit to the Tulum Ruins. Unlike Cancun, which sprang up as a resort destination in the 1970s, Tulum is very historic. The Mayan city, originally a seaport that traded in turquoise and jade, was built in the 1300s. At the ruins, you can see remnants of the city walls, temples and a castle on a limestone cliff overlooking the Caribbean Sea. You must pay an entrance fee. Once inside, visitors can access a beautiful beach located down a steep pathway near the castle. Bring water and plenty of sunscreen. The ruins are not protected by much shade and it gets very hot. Vendors sell refreshing popsicles at the exit. Our meal at Hartwood was as good as billed. You may already know the story of this restaurant in a tangle of jungle in Tulum, especially if you’ve flipped through their gorgeous cookbook. If not, I’ll fill you in. A couple left their restaurant jobs in New York City and moved to Tulum in search of a slower paced life. They opened this off-grid restaurant in 2010. The concept was simple, serve sustainably caught local fish and exotic produce from communal farms. Hartwood’s unprotected dining room closes when it rains. A table at Hartwood has since become one of the most desirable reservations in the world. While they take a very limited number of walk-ins, it’s best to plan ahead. They take reservations via email, one month in advance of your desired dining date. The food is all cooked over wood and dishes are bright and beautiful in their simplicity. 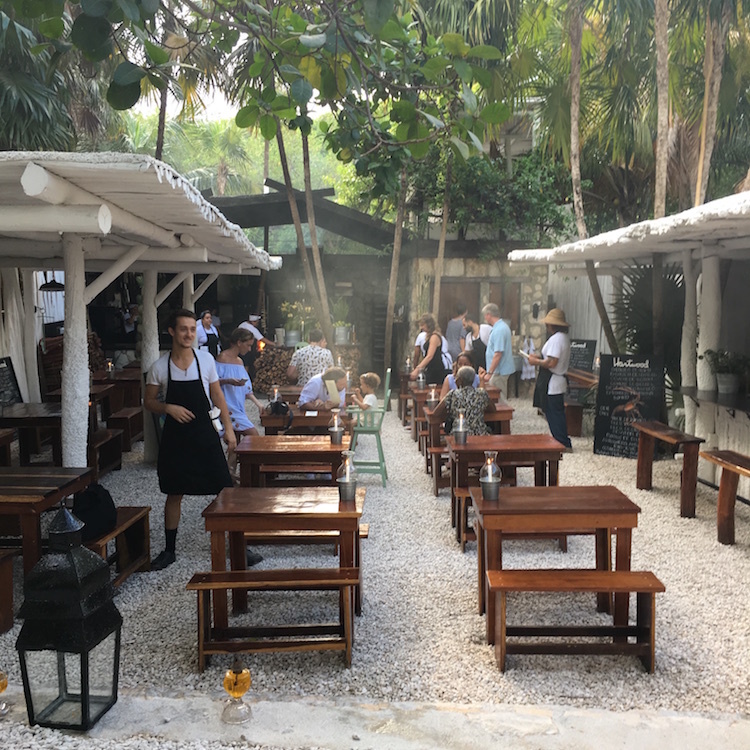 A few standouts include papaya empanadas, Yucatán ceviche with ginger and mescal, and pork ribs lacquered in honey and dark beer. 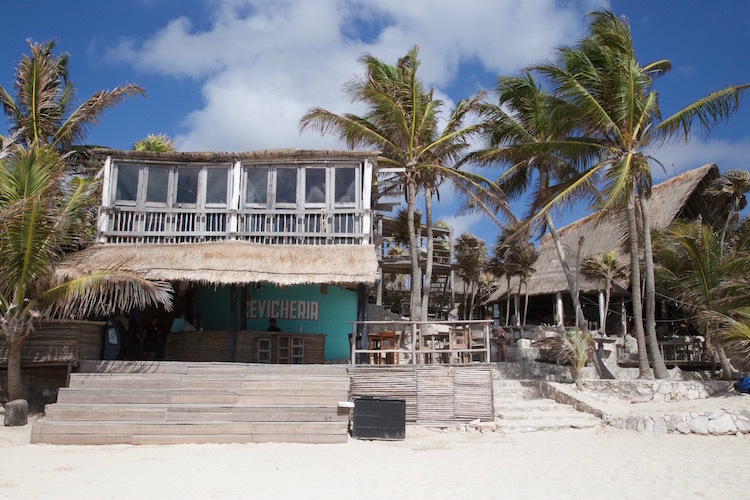 Papaya Playa Project epitomizes the “shipwreck” style architecture Tulum is known for. We stayed at Papaya Playa Project for most of our time in Tulum. I thought our room was a bit small for a family of three and the resort seems geared more towards hipsters in search of a cool scene then families. If you consider yourself in the former category, then it’s a great choice. I loved the aesthetic of the common spaces and the beach club. Even if you don’t stay there, you may want to check it out. The eco-resort is located in buildings abandoned by a previous resort project. They were refurbished, but it all still has a Swiss Family Robinson feel to it. The restaurant overlooks the ocean, and outdoor seating is on tiers cascading down to the beach. 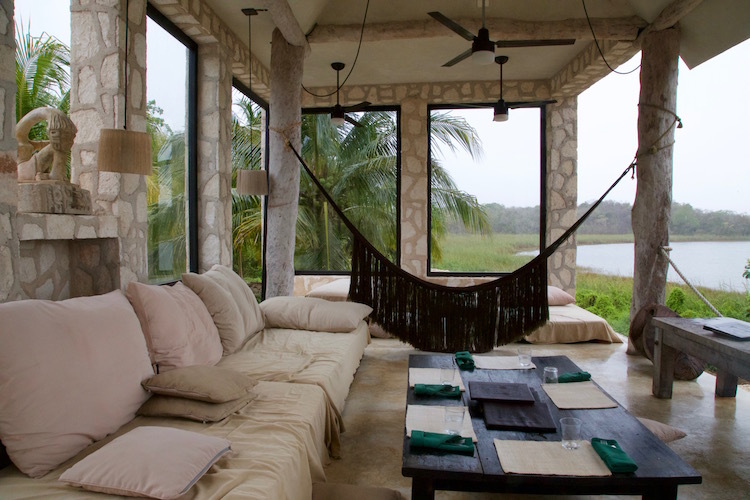 Accommodations are in casitas, some with jungle and some with ocean views. Papaya Playa Project is working towards becoming a zero-emissions property. It has a popular breakfast and a good bar serving refreshing cocktails and excellent Mexican wines. Open since the late 80s, ZAMAS is one of the original Tulum hotspots. The area has changed vastly since then and plenty of other hotels and restaurants have surpassed it when it comes to “hip scenes,” but it still enjoys a perfect position at the arc of a crescent beach and its open-air restaurant has wonderful views of the sea. 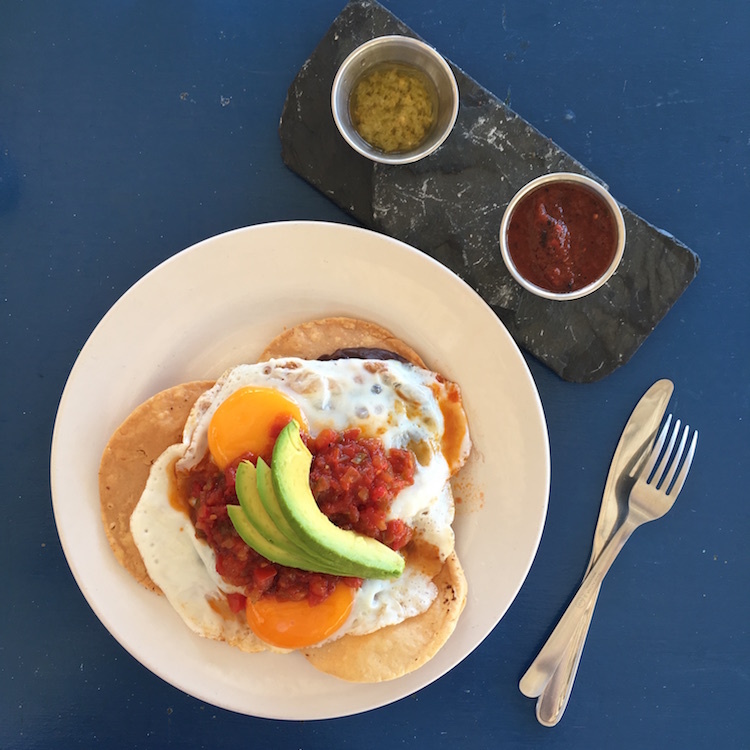 It’s best for breakfast when the kitchen churns out excellent huevos rancheros, ricotta donuts and freshly squeezed juices. A new executive chef joined ZAMAS in 2018, so it’s possible the other mealtimes may be worth a visit as well. 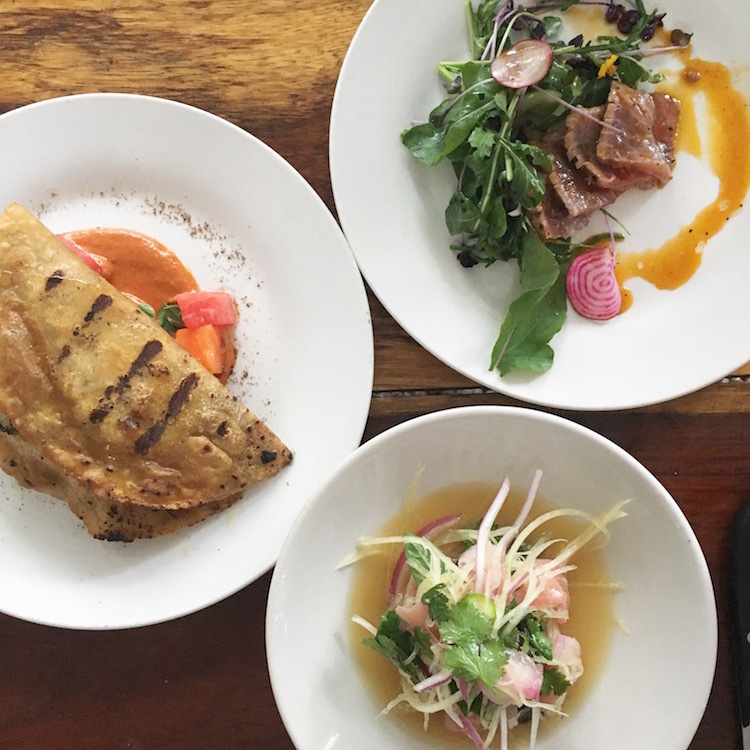 While Hartwood gets all the buzz, Arca is a worthy contender for best dinner in Tulum. It’s not nearly as difficult to score a reservation. Raw edge wood tables sit beneath a wooden trellis. Ingredients are sourced from local farms. Dishes might include grilled lobster tail with heirloom corn and chipotle butter and cornish hen with charred eggplant and pickled green grapes. The house-made sourdough bread and the spicy margarita with habanero-infused Siete Leguas tequila, lime, honey and a chili ancho rim are must orders. Burrito Amor is delicious and healthy. 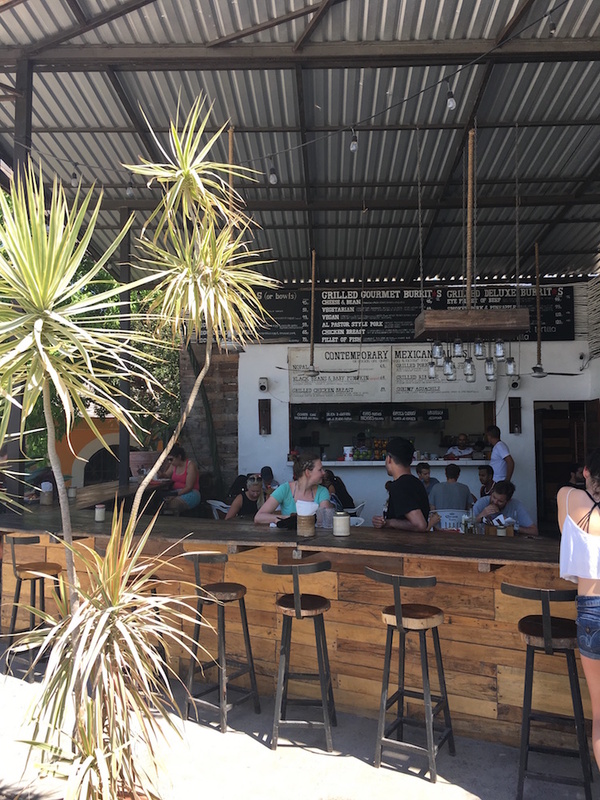 Tourists who visit Tulum mainly stay at the beach hotels and dine at the restaurants along Tulum Boca-Paila, a road that runs right along the ocean, but there’s plenty to check out in Tulum town including Burrito Amor. The outdoor cafe on Highway 307 celebrates clean eating. The menu is packed with superfoods. There are dairy free, gluten free and vegan-friendly options. Grilled burritos like smoked pork with pineapple, whole black beans and bell peppers and shrimp with grilled purple onion, are flavorful and satisfying. Burrito Amor is a great option for breakfast or lunch. It also serves salads, organic egg dishes, breakfast bowls and a variety of vegan and gluten-free pastries. Another jungle restaurant with tables tucked beneath twisty palm trees, Gitana is an excellent place for a cocktail and a light bite, although it does serve a full dinner menu. Mescal-based cocktails are the specialty here. Belly up to the beautiful white bar beneath a wooden canopy for the Jungle Fever made with mescal, chili, lime and cilantro, or a refreshing Gitano Mojito with mescal, white rum, hibiscus and mint. The menu is comprised of snacks, small plates and large plates and dishes are cooked on an open fire grill or in a wood-burning oven and include grilled avocado with salt, ponzu and almonds and a grilled ribeye with salsa verde. Reservations can be booked online through Open Table. Also in Tulum town, Flor de Michoacan is worth a stop for its rainbow of fresh fruit popsicle flavors. Many have pieces of fruit artfully frozen inside. Try fresh strawberry, watermelon or the more decadent chocolate covered in coconut flakes. Flor de Michoacan has a pretty courtyard in the back with a water fountain where it’s very common to see iguanas basking in the sun. The Coqui Coqui Coba feels like you’re on safari. I encourage anyone who visits Tulum to venture to Coba for the day or even a night or two. It takes just 45 minutes to drive to the town on a lagoon. Coba is famous for its ruins. The ancient Mayan city of Coba was at its peak between 201 and 600 AD. The ruins of pyramids, monuments and ball courts are spread throughout a large archeological site overgrown with jungle, but well-marked roads allow you to navigate your way to the various ruins on foot, by bike or by rickshaw. The highlight of a visit is the Nohoch Mul pyramid. It’s still possible for visitors to climb up 130 steps to the top where they’re rewarded with a spectacular view of the peninsula. The perfect place to settle in for happy hour at the Coqui Coqui Coba. The luxury perfume company Coqui Coqui owns a hotel in Coba that looks like something out of an Indiana Jones movie. It’s comprised of two towers linked by a wooden suspension bridge. The Coqui Coqui Coba offers rooms with terraces overlooking the lagoon, a boutique selling perfumes, Panama hats and leather satchels and a small but excellent restaurant serving modern Mayan cuisine and Mexican wine. The cenotes, the Yucatán Peninsula’s famed underground swimming holes, near Coba are not too touristy. Anyone in town should be able to point you to them. Chichén Itzá is one of the new Seven Wonders of the World. No visit to the Yucatán Peninsula would be complete without seeing Chichén Itzá. The ancient city is a UNESCO World Heritage Site. Its architecture, which includes Mayan techniques and elements from Central Mexico, is considered one of the most important examples of the Mayan-Toltec civilization. 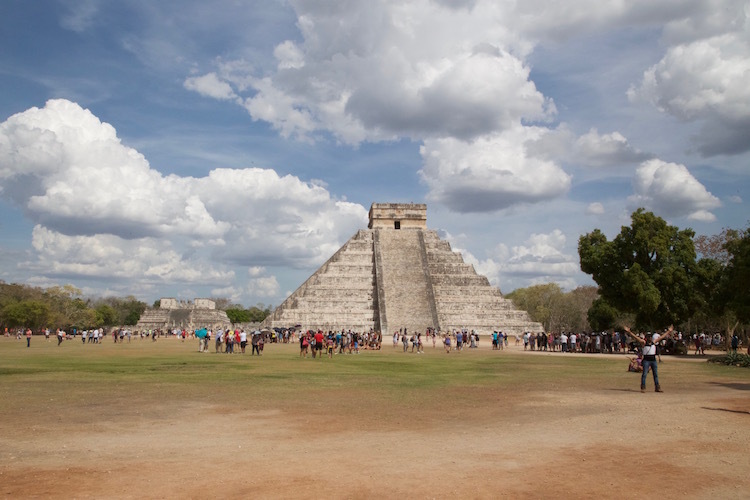 Chichén Itzá’s most iconic building, the Temple of Kukulcan, is one of the new Seven Wonders of the World. It’s an awe-inspiring sight to behold in the center of a large grassy lawn. There are plenty of other things to see at this sacred city, which flourished from 600 AD until about 1000 AD, including the Great Ball Court, the ruddy-colored Casa Colorada, one of Chichén Itzá’s best-preserved buildings, and two cenotes that can be viewed from above. Tulum is on the Caribbean Sea. Ahau Tulum feels more like a health retreat than a hotel with daily yoga classes and sunrise meditation. Rooms are in palapas, Bali huts and cabañas, some with spectacular vaulted ceilings. Casa Violeta is one of the original Tulum boutique hotels. Owner Karla Gutierrez started building the hotel in 2003. 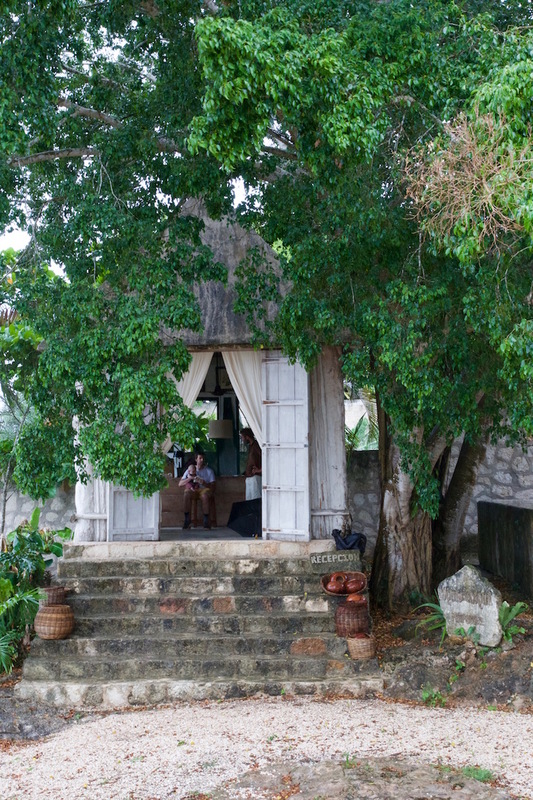 Over the years, it has become a true wellness getaway with a yoga Shala studio, a Mayan medicine house (similar to a sweat lodge) and sound bath treatments. Gutierrez grew up in Guadalajara and Casa Violeta feels authentic. The property’s 13 guest rooms are decorated with locally made artwork and fabrics. Casa Violeta also has a beach-front restaurant serving Italian cuisine. Powered entirely by solar, Alma Tulum is among the most environmentally friendly hotels in Tulum. The grounds feature plenty of bougainvillea and banana trees, giving the property an organic and tropical feel. Guest rooms in wooden cottages have canopy beds hung with gauzy white linens. Some rooms have private terraces with jacuzzis. Alma’s restaurant serves Italian cuisine and a simple breakfast that includes homemade pastries. This Moroccan-inspired hotel was fully booked during our trip, but I would definitely consider staying on a return visit. Rooms and luxury tents feature rustic decor and locally made handicrafts. The Nômade also offers yoga classes, bike rentals and a restaurant serving holistic cuisine. We stayed at the Hip Hotel for one night and we thought it was great despite the cheesy name. It’s very close to Hartwood and Arca. Rooms are decorated tastefully with wooden furnishings and the property is located on a wonderful beach. The restaurant, located in an indoor palapa, has a 180-degree view of the sea. I'm a former broadcast news reporter turned food and travel writer who writes for Sunset Magazine, Travel & Leisure, Robb Report, Departures, Bon Appetit and Cooking Light.